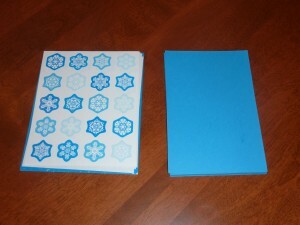 Two of my favorite items to use when making My Obstacle Course stations are colored index cards and stickers. I love how they make things colorful and bright while also allowing me to change up the theme easily with stickers. Before setting up My Obstacle Courses, I always think about what skills Andrew needs to build and how I can incorporate them in a fun way. Early on, I was thinking of the math skills he needed and was trying to find out more about what he knew. At that point in time we were working with him on numbers (the actual number and what that number represents) and number order. I had used some regular playing cards found in a drawer and one day had the idea of creating my own “playing cards” using index cards and stickers. This would be a perfect way for me to combine concept and theme. This is really easy and quick to make. 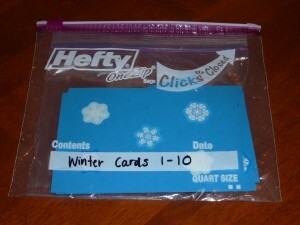 Take a card and place the same number of stickers on it as you want it to represent (ex. one sticker on the 1 card, two stickers on the 2 card, etc.). 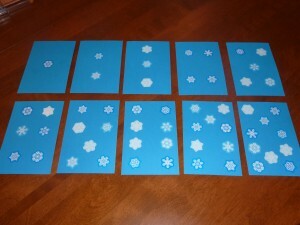 The photo below shows my completed sticker cards in order from 1-10. 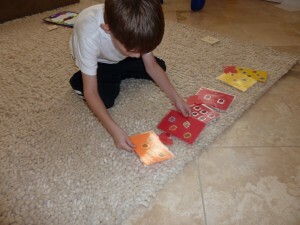 I do not put the numbers on the cards because I want to be able to see how he is counting. 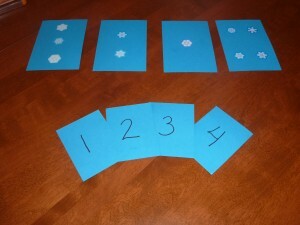 My Obstacle Course station activity: Put these cards in order from 1-10. 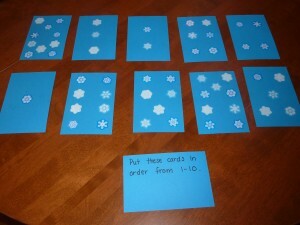 Make number cards that match up with the sticker cards you’ve chosen. 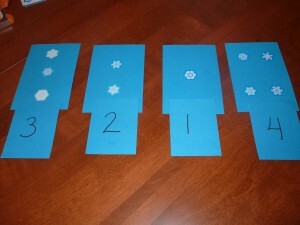 The numbers shown below are made with same index cards cut in half. 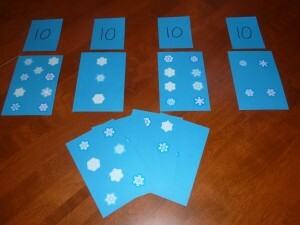 Set out the numbers for the child to match up with the sticker cards. 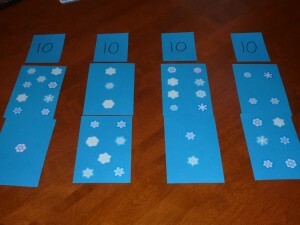 My Obstacle Course station activity: Match the number with the card that has the same number of stickers. Matching up numbers with correct card. Numbers matched up with correct sticker cards. I choose a number and write it down. I then select sets of cards that when put together, they make that number. When putting the station together, I separate the cards so that one card from each set is put out underneath the number and I mix up the other cards. This activity is giving them the sum and one addend and they have to figure out what the other addend is! When he gets there he will look at the number to make (10 in this photo). He will count the number of stickers on the first card under the number. 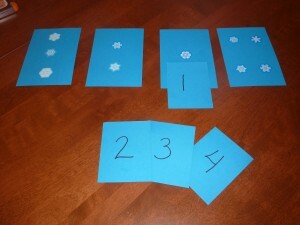 Then he will choose a second card from below that he thinks will help to make the given number. He’ll count the stickers on the two cards to see if they make the number. If he doesn’t get it, he’ll choose another one from below and see if it works. If he gets it, he moves on to the next set, continuing until all sets are matched up. Note: When we first began doing this, Andrew went about this in a fairly random way but I have seen him grow and begin to strategize a bit. I can see him really thinking about the number he is starting with and choosing his next card based on what makes the most sense. Cards matched up for Make This Number. This photo shows 9+1, 3+7, 8+2 and 4+6 which all make 10. Andrew making 9 while doing My Obstacle course station "Make This Number." 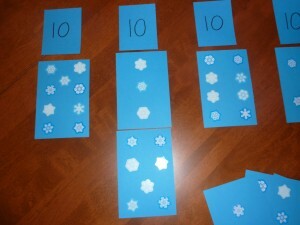 These cards are quick and easy to make yet provide many different ways to build math skills at many different levels. I have shown you just some of the ways I have used them in my home. I encourage you to think about the skills your child needs to build and see if there is a way to use these fun, colorful sticker cards to help!